Bendable 34" metal tube for multi-directional adjustment. Easily adjust tablet to any orientation, angle or position. 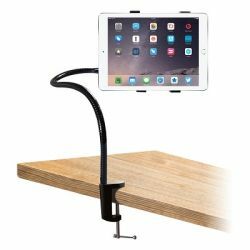 Adjustable C-clamp easily mounts to desks, tables and other flat surfaces. Additional shipping charges apply.